Ever wish you could go to a bar where everybody knows your name? No, we're not talking about "Cheers." 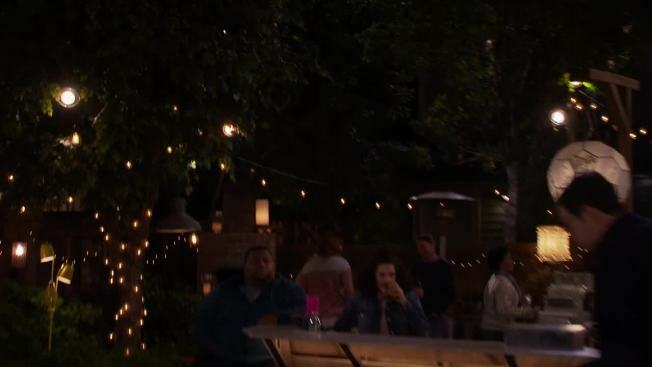 "Abby's" is a new NBC comedy about a makeshift backyard bar where San Diego locals come to drink and find camaraderie. Leading lady Natalie Morales is believed to be the first Cuban star of a broadcast comedy since "I Love Lucy's" Desi Arnaz and is playing one of the few openly bisexual characters of color on broadcast television. Natalie Morales talks about her show "Abby's" and tells an embarrassing story about David Caruso on the set of "CSI: Miami." When asked about the personal significance that holds, Morales said it was a "huge huge thing" for her. "I didn't grow up with anybody like me on television, so it's really incredible to be a part of that and maybe there's some brown queer kid out there who's watching TV and going like 'Oh, that's cool,'" she said. "That's like a normal person, and it's okay and it's fine and they're on television so it must be normal and fine. And they're living their life and they have friends and people who love them. I think the more we normalize the people around us, the less divided we'll be." Morales, like her character, also identifies as bisexual. In 2018, Morales was featured on Out magazine's Out 100 list. The Abby character was written before casting, so her sexual orientation was already decided, but her Cuban heritage was added after Morales came onboard. Natalie Morales chats about becoming her new NBC comedy, "Abby's," and how she's constantly confused for her name twin at NBC News. Previous credits for the star include the HBO series "The Newsroom" as well as "Girls" and "Parks and Recreation," in addition to films like "Battle of the Sexes" and Sony's "Spider-Man: Into the Spider-Verse." Morales also starred in "Santa Clarita Diet" and recently directed an episode of "Room 104." But throughout her career, she has often been confused with NBC anchor Natalie Morales. "It happens constantly," she said. "It happened last week! The "Today" show tweeted at me thinking it was her. Her own show!" As for the comparisons between her character and Ted Danson of "Cheers," Morales feels that while flattering, the similarities end with the bar setting. "We are outdoors in San Diego as opposed to underground in Boston," she said. "There are a lot of hospital shows and a lot of courtroom shows, so I feel like we're okay to have another show set in a bar 35 years after 'Cheers,'" Morales added. In the show, bar owner Abby (Morales) is a former staff sergeant in the Marines who still has a penchant for rules, as long as they're of her own making. Cell phones are strictly not allowed and patrons must earn their seat at the bar. Sugary drinks are doled out as punishment for losing "challenges." Morales said what she likes about the show is that it depicts the characters as well-rounded and multi-faceted people. "I think that often times vets are depicted as though that's the only thing about them and they're rich, full people like everybody else," Morales said. "That's a big part of their lives, but it's not the only thing." For the pilot, Abby's bar comes under threat when the new landlord Bill (Nelson Franklin), drops in and discovers the illegal set up. With a bit of coaxing from the bar patrons, he agrees to let Abby keep the bar, as long as she makes a few changes. The show is a 10-episode multi-camera sitcom filmed entirely outdoors in front of a live studio audience. The outdoor studio is located on the Universal Studios lot, beside Burbank airport. "Luckily it never rained, so that's nice," Morales said. "There are some sound issues sometimes, planes flying over and such but most of the time we really luck out." "Abby's" was created by Josh Malmuth, a San Diego native. Abby's bar primarily serves beer, something that the city of San Diego prides itself on. As an homage to the city's craft beer culture, viewers may spot a few local San Diego beers on the tap. In real life, Morales prefers an old fashioned, she said. In addition to her acting career, Morales is an activist, advocating on behalf of Best Friends animal society and Everytown for Gun Safety's Creative Council. "It's not about taking people's guns away. It's just about gun sense and gun safety," Morales said. "It's an epidemic in our country and I think if we all come together on that and start to realize that and put people before weapons, I think we can get somewhere great." "Abby's" airs on NBC Thursdays at 9:30 p.m. ET. Disclosure: Comcast is the owner of NBCUniversal, parent company to NBC and this station.